A Paramedic is the highest level of Pre-hospital health caregiver. The Paramedic wields skills and know-how, to manage health issues including Medical and Traumatic problems before the patients are transported to the hospital. They work as members of the Emergency Medical Service (EMS). Their skills include: Oxygen Administration, Wound Dressing, Intramuscular Drug Administration, Intravenous Access, Cardiac Arrest Care, Endotracheal Intubation amongst others. Paramedics in this century have an expanded role. They can work in the Emergency Department, Rehabilitation Unit, with the Police, Army and Various Security Agencies (Tactical EMS), Road Safety Agencies, Airports and so on. Currently there are 40 paramedics employed by the University of Benin Teaching Hospital.These Paramedics work In hospital activities. The Paramedics currently work in the Trauma and Medical Emergency sections of the Accident and Emergency unit. The Paramedics in collaboration with the Doctors and Nurses perform triaging of patients as they enter the unit, they sort out all patients to determine whether they present with a medical or surgical/traumatic condition so that they can be moved to the appropriate section. In assisting the doctors, the Paramedics resuscitate the patients and carry out medical procedures including, but not limited to Oxygen administration, administration of drugs, Wound Dressing, Urethral Catheterization, Blood Sample Collection and Documentation. The Paramedics also transfer patients to the Radiological Department to perform X-rays, Ultrasound Scans, CT-Scans and other Radiological Investigations. The Medical Emergency of UBTH receives patients with Medical Conditions including but not limited to Diabetic Emergencies, Hypertensive Emergencies, Asthma, Stroke, Meningitis, Exacerbation of Mental Health Conditions, and Hematological Emergencies. As part of the Medical Emergency Team(MET) which includes the Doctors, Nurses, Paramedics, and Porters, the Paramedics carry out Medical Procedures on the patients. The Paramedics are also stationed in the Neurosurgical ward; they augment the Doctors and Nurses in the ward, systematically moving patients to perform X-Rays, Ultrasound Scans, CT-Scans and other Radiological investigations. They also assist in rendering acute care to patients in the ward including rehabilitation. Radiotherapy unit Supporting the Doctors in the Radiological Department. The Paramedics render acute care to the patients and collect blood samples, initiate blood transfusion and administer chemotherapeutical agents to the patients. Since 2012 the Paramedics in the University of Benin Teaching Hospital have been involved in Pre-Hospital Medical care. They have been called to Residential Buildings and Public places to administer care to persons in need of medical assistance and transporting these persons to the hospital. The Paramedics have also been stationed at Church Crusades, Political and Social gatherings to render emergency care if the need arises. Due to the transit location of the hospital, there is a daily increase in patient load; therefore some patients may be needed to be transferred on request or for specialized medical care to other Medical Facilities. The Paramedics have been tremendously useful to this effect; they have transported patients to various states and airports within the country rendering medical care reroute. Some of the paramedics are also instructors in the UBTH School of Paramedic Training. In a bid to keep up with the advancement of Medical Practice Worldwide, the paramedics participate in regular Tuesday clinical meetings with other staff of the emergency department including Doctors, Nurses, Pharmacists, Lab Scientists, EMTs, Social workers etc. They also have regular Friday paramedic breakfast meeting where topics of special interest are discussed, drills and scenarios practiced. They also participate in Basic Life Support (BLS), Advanced Cardiovascular Life Support (ACLS) and International Life Support (ITLS) Courses. The paramedics function under the headship of a Chief and Deputy Chief of Paramedics, under the headship of the Coordinator of Accident and Emergency/Paramedic Training. The Paramedics have portfolios to aid community service. Such activities include activities like Enlightenment Campaigns such as Seat belt use, Medical Screening such as BP screening for Market Women, talks to commercial tricycle drivers and teaching Basic Life Support to Secondary School students. The UBTH paramedic programme enjoys a lot of international collaboration. The first set of books were donated in 2008 by professor Bryan Blesoe a paramedic and professor of Emergency Medicine at Nevada School of Medicine. He has been a mentor of the programme for many years. Further linkages came through the Fountain of Living waters (FLW) an NGO based in New Jersey USA whose executive director is Dr. Hellen Kest an Alumnus of University of Benin who linked our Centre with St Joseph Regional Medical Centre in New Jersey. have been donated to the program that has helped us train and send more paramedics to several areas of Nigeria. The partnership has also greatly benefited from the “train the trainer” program which is currently on its third year. Michael Tarantino, Director of the Bergen County Emergency Medical Services Training Center in Paramus, has been a great supporter of our program. Today, we can boast of high quality education and patient care because of all our partners. The Fountain of Living Waters (FLW) have made several onsite visits to UBTH and trained Paramedics on Emergency Response, and Disaster Management. Other staff trained included Doctors, Nurses, EMTs, Fire Men, Administration Staff in various Departments. This collaboration has enabled some Paramedics to travel to the United State of America (USA) for onsite training in Advance Emergency Response and Para Medicine in general. The Emergency Department Staff and Paramedics of UBTH have via Polycom participated in Emergency Medicine Training sessions with SJRMC and Drexel University in Philadelphia as part of CMEs. The School of Paramedic Training was established in UBTH in 2008 as part of the Institute of Heath Technology that has eleven training schools. The school was established by the then Chief Medical Director Prof. Eugene Okpere assisted by the then Chaiman Medical Advisory Committee Prof. Michael Ibadin who is now the CMD. The pioneer Principal of the Institute is retired Barrister Osuide C. O. and the Director of Training till date is Prof. Pius Iribhogbe who also is the Coordinator of Accident and Emergency Services. 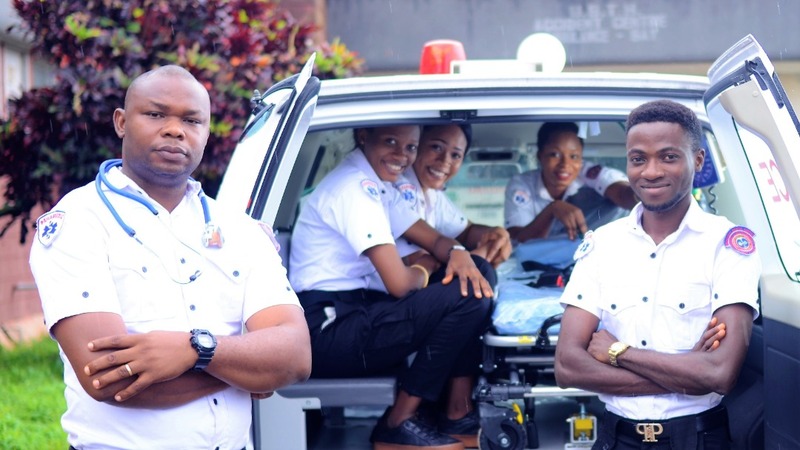 As the first and only recognized paramedic training school in Nigeria, the Institute of Health Technology (IHT) in UBTH has since 2008 been training Paramedics and has since inception graduated 49 students of which 40 are presently working in UBTH. In 2014 the Federal Ministry of Health(FMOH) and National Board for Technical Education (NBTE) launched the National Curriculum for Paramedic Training in Nigeria, which has been adopted by the UBTH. The paramedics work under the supervision of a Medical Director-The Coordinator of Accident and Emergency Services. They also have Chief Paramedic, Chief Instructor and their Deputies who aid the administration process.